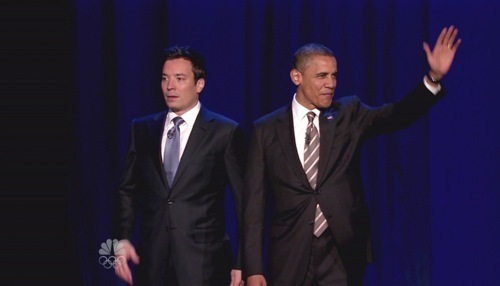 Okay, so this needs no explanation other than this: United States president Barack Obama schedules an appearance on Late Night With Jimmy Fallon. Then, proceeds to partake in a skit called “Slow Jam The News” with Jimmy Fallon and his backing band The Roots. The song? A slow jam about the current fight to not raise interest rates on subsidized student loans for college students. All in favor of a Barack Obama record deal say oooohhhhh yeahhh…! Look, occasionally we’ll Tweet something semi-political and either gain or lose a follower. Opinions will be opinions and you all have a right to your own. However, it’s impossible to deny that the always charismatic Obama reaching out to mainstream media in this manner is not only highly entertaining, but is also a great way to spread word in a light way about the happenings within the United States of America. Put your opinions aside and enjoy the video below! This entry was posted in Sine Wave and tagged Barack Obama, Jimmy Fallon, Slow Jam The News, The Roots. Bookmark the permalink.